We’d love your help. Let us know what’s wrong with this preview of Mimi's Adventures in Baking Chocolate Chip Cookies by Alyssa Gangeri. 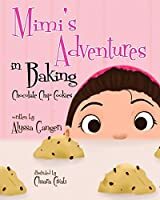 Embark on a baking adventure with Mimi where she will measure, mix, and bake her way to the perfect batch of chocolate chip cookies. If Mimi can do it, so can you! To ask other readers questions about Mimi's Adventures in Baking Chocolate Chip Cookies, please sign up. I think I am especially hard on children's books. I don't want children growing up thinking that bad writing is okay, that you have to settle on books that are not exciting or fun, or get misinforma Anyone who follows my reviews knows that I love children's books and have a group of children that I share these stories with (our "reading time" on my front porch), plus I love anything having to do with cooking, so when I was asked to take part in the blog tour for this book, I could not pass it up. The book is very descriptive with each step, but it’s not over done where a child could lose interest such as the gathering of the ingredients/equipment and talking about safety. I liked how the steps are also broken down in a fun wa This is such a fantastic children’s cook book! From the very beginning it grabs children’s attention and continues to build excitement while teaching how to bake chocolate chip cookies. The cute facial expressions and bright colors only help keep a child’s attention. Mimi's dreams of ingredients leads her to ask Nonni to help her bake chocolate chip cookies for everyone to enjoy. This delightful and educational book will help you create fun times for you and your child in the kitchen. Readers can follow along with Mimi and Nonni as they make chocolate chip cookies, then flip to the end where the recipe for Nonni's Chocolate Chip Cookies appears. There is also a page with substitutions, so readers can get a creative with their cookie recipe. I loved this book Mimi's dreams of ingredients leads her to ask Nonni to help her bake chocolate chip cookies for everyone to enjoy. This delightful and educational book will help you create fun times for you and your child in the kitchen. Readers can follow along with Mimi and Nonni as they make chocolate chip cookies, then flip to the end where the recipe for Nonni's Chocolate Chip Cookies appears. There is also a page with substitutions, so readers can get a creative with their cookie recipe. Not only does this book describe the technique and recipe for baking cookies, but it also focuses on a story. There are many ways to read this story. You can simple read it as a wonderful book. You can focus on the bright illustrations. The ingredients and steps make for the perfect math focu Since my daughter wants to be a chef when she grows up, I have read several cooking books and cookbooks with her, but nothing comparable to Mimi's Adventure in Baking Chocolate Cookies. What a fabulous book! This book is so adorable! I absolutely love this children's book. There are lots of lessons about kitchen safety and measuring as well as fun. And the main character calls her grandmother Nonni, just like my daughter does. I want the rest of the series. Mimi dreams of clouds of flour and mountains of chocolate chips and, when she wakes up, all she wants to do is bake chocolate chip cookies. But she's never done it before, so she asks for Nonni's help. Nonni finds the recipe and teaches Mimi how to collect all the necessary ingredients and materials before starting. Then Nonni shows Mimi how to measure each ingredient. She also answers all of Mimi's questions, including why we add salt to a sweet recipe. And finally, they get to bake! This is a c Mimi dreams of clouds of flour and mountains of chocolate chips and, when she wakes up, all she wants to do is bake chocolate chip cookies. But she's never done it before, so she asks for Nonni's help. Nonni finds the recipe and teaches Mimi how to collect all the necessary ingredients and materials before starting. Then Nonni shows Mimi how to measure each ingredient. She also answers all of Mimi's questions, including why we add salt to a sweet recipe. And finally, they get to bake! This is a cute and funny book, and the illustrations by Chiara Civati are delightful. The text clearly explains all the basic steps for a beginner. There are safety instructions, tips on getting ready, explanations as to why certain things are done, and - best of all! - a delicious recipe, plus variations. I read this book with my daughter, and then we baked the chocolate chip cookies. She was quoting the book back to me as we cooked (e.g. the brown sugar "making a sand castle", placing the cookies "four fingers apart", and being on "cookie guard" duty). Let me tell you, the cookies were delicious! Our verdict: "Best cookies ever!" I love the relationship between Mimi and her Nonni (her grandmother) and the fact that they set the table for the whole family to share milk and the cookies they bake. My only concern is that the oven temperature is described as 325°, without specifying whether it's Fahrenheit or Celsius. While it would be okay to just use F in the story, both temperatures should be provided in the recipe at the end. By the way, 325°F is equivalent to 160°C. I look forward to Mimi's next baking adventure. Happy baking! What an awesome cut children's cookbook!!! I volunteered to read this with my Great Niece (since I don't have any grandchildren of my own yet). But once I received the book, I didn't want to wait for Addison to be there to read it with me -- so I decided to read it on my own for now. AND OMG -- this is such an awesome book!!! I love the illustrations throughout the whole book -- the bright colors and the cute facial expressions will definitely keep a young child's attention. I also like that the What an awesome cut children's cookbook!!! I volunteered to read this with my Great Niece (since I don't have any grandchildren of my own yet). But once I received the book, I didn't want to wait for Addison to be there to read it with me -- so I decided to read it on my own for now. AND OMG -- this is such an awesome book!!! I love the illustrations throughout the whole book -- the bright colors and the cute facial expressions will definitely keep a young child's attention. I also like that the recipe is in the back of the book -- because, knowing Addison, we will be making these cookies just the way that Mimi made hers!!! I received a complimentary copy of Mimi's Adventures in Baking Chocolate Chip Cookies in exchange for my honest review. All opinions shared are 100% my own. Chef Alyssa has been baking since she was a little girl in her grandmother's kitchen. Since graduating from the Culinary Institute of America she has worked for famous chefs and elite companies such as the Ritz Carlton, Tom Colicchio, Norman Van Aken and Gray Kunz. She currently is the Executive Chef at Riverwalk Bar and Grill on the Historic nook of New York City, Roosevelt Island. She also has a Chef Alyssa has been baking since she was a little girl in her grandmother's kitchen. Since graduating from the Culinary Institute of America she has worked for famous chefs and elite companies such as the Ritz Carlton, Tom Colicchio, Norman Van Aken and Gray Kunz. She currently is the Executive Chef at Riverwalk Bar and Grill on the Historic nook of New York City, Roosevelt Island. She also has a boutique custom cake company called AllyCakesNYC where she creates cakes to appease the imagination. Through her journey of baking she developed Mimi, her very own miniature version of herself.